This is the PDF Cover. I will replace it with a photo/scan of the actual book when I get a chance. 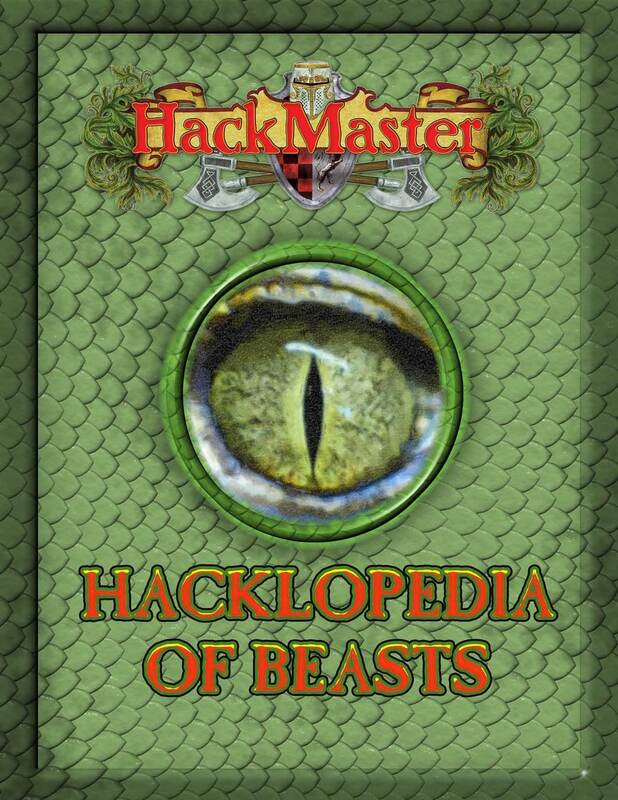 First, it should be noted that the Hacklopedia of Beasts is designed for use with HackMaster Basic and the current version of HackMaster currently in development. While it is beaten in sheer number of monsters by books such as Frog God Game’s Complete Tome of Horrors, the Hacklopedia of Beasts wins my vote as best monster book for several reasons (and to establish a pedigree, I have monster books from AD&D, AD&D 2nd edition, D&D 3.0 & 3.5, Pathfinder, D&D 4E, Star Wars Saga Edition, Star Wars: The Role Playing Game (WEG D6), and others). Despite not having the most monsters, it has a sufficient selection that you should be able to find something that fits your needs, whatever they may be. Presentation: The Hacklopedia of Beasts is second-to-none. From the leather-style cover to the sketch drawings of the monster, every part of the presentation of this monstrous tome is designed to make you feel like you’re reading a journal from those who have seen and fought these monsters. Not only do you get detailed descriptions of each monster, their ecology, and probably combat tactics, you get information on what sort of tracks they leave and whether or not they’re edible, can be “harvested” for any special ingredients, and many include comments from one of “authors” of the Hacklopedia, written from an in-world point-of-view. The end result is a book that is not only useful for any HackMaster game, but one in which the flavor can be used in ANY fantasy role-playing game. The paper stock is heavy and glossy and the whole book FEELS like a weighty tome of old filled with information gleaned at great personal risk to the authors. Utility: Kenzer & Co. has developed an elegant stat block design that includes a “Combat Rose” for quick reference when the player characters encounter one of these beasties. While I won’t go into the Combat Rose specifics here, it is visually appealing and designed to have all the most-commonly needed stats in a handy, easy-to-use format. Of course, monsters are arranged alphabetically, and variants are included with monsters that need them (racial variants of orcs, several types of mummies, etc.). Not only are all the monsters illustrated, but there are size comparisons with humans for all of them. It also shows the creature’s range on the world of Tellene (aka Kalamar, the default setting for HackMaster). I still think Ptolus is the best and most-usable RPG book I’ve ever seen, but the Hacklopedia of Beasts is a close second if not a tie. They’re really designed for completely different purposes, so it’s a little like comparing apples to oranges. One look at this book, and you’ll not question Kenzer & Co’s commitment to quality and to their game. Their release schedule may be slower than some of the big dogs in the RPG industry, but the quality of the product more than makes up for it. CAVEAT: There are no dragons in this book. “A monster book for a fantasy RPG with no dragons? ?” Yes, it’s true. However, I have heard folks from Kenzer & Co. (I believe it was Dave Kenzer himself) say that they didn’t want to cram them in when, in order to do justice to dragons for HackMaster, they really deserved their own book. It makes sense, especially since they’re trying to build an identity for HackMaster as a serious RPG in its own right (the current version is no longer a legally-mandated parody of AD&D). When you get HackMaster dragons, you’re going to get a product as deluxe as this that is focused on dragons in a way that makes them an integral part of the game that feels right. Everything I’ve seen Kenzer & Co. put out for HackMaster FEELS RIGHT as far as that game is concerned. You owe it to yourself to pick this book up, even if you don’t play HackMaster. It has sufficiently different takes on the monsters you are familiar with that might be just what you need to throw your players off balance and create some really memorable encounters using monster they might think they already know all about. I think this book has raised the bar considerably when it comes to quality. Definitely. It’s the Gold Standard by which all other monster books (at least) should be measured now. I would be shocked, SHOCKED if it didn’t win awards. And I hope I can say that as a member of the ENnies staff (I have NO say in nominations or winners aside from 1 vote like everyone else).